Dr. Jason Ming Zhao graduated from Hunan Medical University in China in 1982. He had a busy ophthalmic practice in China when he and his wife accepted an opportunity to move to San Antonio and work in medical research at the University of Texas Health Science Center. 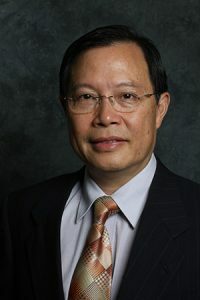 Between 1991 and 1997, Dr. Ming presented and published many scientific papers. However, he missed taking care of patients. For this reason he returned to active medical practice. He began his training in the United States with a surgical internship and an ophthalmology residency at the University of Texas Health Science Center. Dr. Ming and his wife, Joan, have two children. Jenny, who was born in China in 1989, loves ice-skating and prefers “American” food to Chinese food. Jared was born in San Antonio in February of 2000, just a few months before Dr. Ming and his wife became United States citizens. ‘Jason’ is his adopted American name, ‘Ming’ is his given Chinese name and ‘Zhao’ is his family name. We call him Dr. Ming because it is easy to remember and say. Dr. Ming enjoys photography and painting, and is skilled in the use of computers. Click here for articles by Jason.